After you have invested time determining the amount of money you can afford to spend on a new home, examining the type of mortgage that may be most appropriate for you, and getting a preapproval letter from the lender of your choice, it’s time to go house hunting. Begin your home search by driving around prospective neighborhoods, visiting open houses, and using the Web to do a lot of your preliminary legwork. Many Web sites draw from a central database, also known as the Multiple Listing Service (MLS). The National Association of Realtors has one of these Web sites. In many locales, major real estate companies dominate the marketplace, and their Web sites can yield good information as well. Before you get too attached to a certain property, make sure that you have thought through the issues that are most important to you and what you want out of this new home. 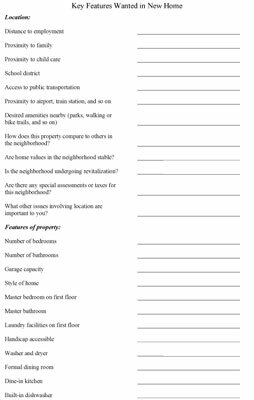 Consider using the Key Features Wanted in New Home worksheet provided here as a guideline and brainstorm the issues that are most critical when comparing properties. Complete one worksheet per property you are considering. Click here to download and print the Key Features Wanted in a New Home Worksheet. As a home buyer, consider hiring a real estate professional as your buyer’s agent. It costs you nothing and can save you thousands of dollars. You save your time and energy when you allow a real estate agent, empowered with the information in your Key Features Wanted in New Home Worksheet, to locate the properties that best meet your needs. If you have little or no experience buying a home — this is a must! If you are too busy doing what you do for a living and taking care of your family, let a real estate agent work for you. Find a real estate professional who has extensive experience buying and selling properties in the neighborhoods in which you are most interested. Cruise the neighborhood and jot down the names, phone numbers, and companies of the realtors listing properties; also write down the properties’ addresses. Then, when you return home, visit the real estate agents’ companies’ Web sites, read about the real estate agents, and check out the properties listed. Soon you will discover who the “movers and shakers” are in your target real estate market.